Cataracts are a common problem as people age. My question is: Has there been any research or reports of long-term fruitarians avoiding cataracts, or change to a raw food diet after development of cataracts reversing the symptoms? In my case, with adoption of an 80/10/10 diet after getting cataracts, I find that my cataracts are still worsening. I had been told that I had cataracts forming several years ago, but they are now worsening such that I expect I will have to have the surgery. But I might delay it as long as I can to see if the fruitarian diet will slow down, if not reverse the problem. Any information you can find out about this problem will be greatly appreciated! 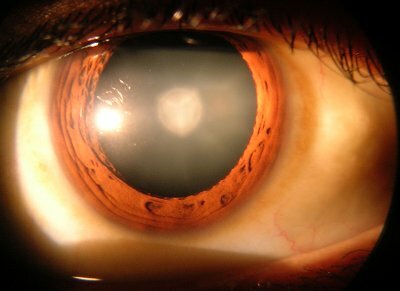 Cataracts have traditionally been a bit of a mystery. Researchers wonder why in some people - but certainly not all - the lens of the eye becomes clouded over as they get older. Basically, you've got this yellow-brown pigment building up within the lens, which leads to less light getting in, which means less light strikes the retina. The end result is gradually-increasing blindness. There are few studies following people on healthy raw diets, and even fewer dealing with specific disease incidence among raw foodists. More broadly, though, we know that dietary choices have a tremendous impact on your chance of developing cataracts. One study looked at various levels of meat and animal food consumption among groups, and compared their chances of developing cataracts (1). The highest meat consumption group ate at least 100 grams of meat a day (note: average consumption in the US is closer to 330 grams a day). There was also a group that ate 50-99 grams, less than 50 grams, a group that only ate fish, a group that was vegetarian, and a group that was vegan. Those avoiding meat, eggs, and dairy had a 40% reduced risk of developing cataracts compared to the highest meat consumption group in the study. It's unclear if it was the consumption of animal products causing the increased risk, or the lack of plant foods (because animal calories displace plant calories). Other studies have correlated the consumption of a wide variety of fruits and vegetables - particularly leafy greens such as kale and spinach, citrus fruits, red peppers, cantaloupe, mangoes, and apricots - with a reduced risk of developing cataracts. Unfortunately, I'm aware of no studies successfully reversing cataracts using any dietary strategy. I've known several people who have tried it on raw diets, but as far as I'm aware, none of them have been successful. I'm not saying it can't work, but merely that I know of no one who has done it. However, I have met several people who have undergone long water fasts and gotten rid of their cataracts. If this possibility interests you, I suggest you talk to Dr. Douglas Graham, who supervised my water fast. Otherwise, surgery is likely your best bet. Got a question of your own? Ask it. 1) Appleby PN, Allen NE, Key TJ. Diet, vegetarianism, and cataract risk. Am J Clin Nutr. 2011 May;93(5):1128-35.